TSPSC RWS & S AEEs Marks List Results 2018: TSPSC AEE /Assistant Executive Engineer Hall tickets, Answer keys, Results 2018: TSPSC AEE/Assistant Executive Engineer Posts 2017 Recruitment Hall tickets/ TSPSC AEE Posts 2017 in RWS and S Department: The Telangana State Public Service Commission (TSPSC) has begun the recruitment process with the issuance of its notification for filling up 277 Assistant Executive Engineer posts. Candidates with BTech/ BE Civil engineering graduates are eligible to apply for the notification. As reported in these columns one time registration is mandatory, the candidates have to register with TSPSC in order to apply for any notification issued by the Commission. TSPSC has given the notification for filling up 277 Assistant Executive Engineer posts and applications are invited Online from qualified candidates through the proforma Application to be made available on Commission’s WEBSITE (www.tspsc.gov.in) to the post of Assistant Executive Engineers in Various Engineering Services in the State of Telangana. In Continuation of the result Notification dated 19/07/2018,It is hereby notified that onthe basis of the computer-based examination held on 1-4-2018 to the post of Assistant Executive Engineers in Rural Water Supply and Sanitation Department, the candidate with the following Hall ticket Numbers have been provisionally admitted for the Verification of Certificates. 2. The candidate who are admitted for the verification of certificates are required to produce the Original certificates along with one set of Photostat copies duly attested by Gazette Officer,, relating to Age, Qualifications, Community (Integrated),Latest Creamy Layer exemption certificate in case of B.Cs as per Memo No.3009/BCW/OP/2009, Government of Telangana, Backward Classes Welfare (OP) Department, Dt:18/12/2015 (prescribed format hosted on website), Certificates relating to claim of age relaxation, , Study (from 4th class to 10th class) basic information data (Check list (1 set) attestation forms ( 2 sets) and if any, at the time of verification of documents, failing which, they will not be admitted in subsequent process of selection. No request will be entertained for subsequent submission of any of the above certificates. In terms of the notification, the candidate shouldpossess the requisite qualifications as on date of notification i.e., on 17-11-2017. TSPSC RWS & S AEEs Certificates verification dates, Results 2018: The Verification of Certificates (3rd Spell) for the post of AEE’s in RWS&S is scheduled to be held on 28th & 29th August 2018 from 10:00A.M onwards at TSPSC Office, Prathibha Bhavan, M.J. Road, Nampally, Hyderabad. For result and further details visit (memo, check list and attestation forms can be down load from Commission’s website) www.tspsc.gov.in . 1. In Continuation of the result Notification dated 19/07/2018 & 06/08/2018, It is hereby notified that on the basis of the computer-based examination held on 01-04-2018 to the post of Assistant Executive Engineers in Rural Water Supply and Sanitation Department, the candidate with the following Hall ticket Numbers have been provisionally admitted for the Verification of Certificates. 3. The Verification of Certificates will be held in the office of TSPSC at Prathibha Bhavan, Nampally, Hyderabad on 28TH & 29TH August 2018 from 10:00 A M onwards. TSPSC has conducted Written Examination for the above notification on 01/04/2018. The Final Keys of this exam will be available on TSPSC website from 16/05/2018. For further details please visit www.tspsc.gov.in. No further objections will be entertained on Final keys. 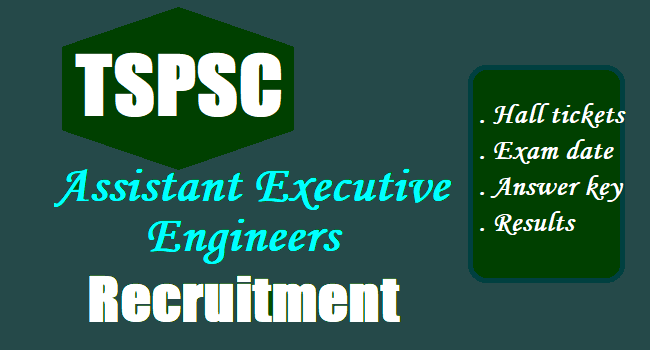 The Telangana State Public Service Commission (TSPSC) has issued a notification for the recruitment of approximately 277 assistant executive engineers (civil) in rural water supply and sanitation department of the state on its official website. Interested and qualified candidates need to apply online through the proforma application available on commission’s website. The application can be submitted from November 24 to December 16. The dates of the written examination (objective type) will be announced later and the hall tickets can be downloaded seven days before the exam begins. The examination will be either computer based recruitment test (CBRT) or offline OMR based. A candidate applying for the job should be of minimum 18 years and maximum 44 years as on July 1, 2017. There is an age relaxation for Scheduled Castes, Scheduled Tribes, Backward Class and some other categories of candidates. Applicants must possess the qualifications from a recognized University as detailed below or equivalent thereto, as specified in the relevant Service Rules, indented by the departments as on the Date of Notification. The Details of Vacancies department wise i.e., Community, Zone Wise and Gender wise (General / Women) may be seen at Annexure-I in Notification. EXPLANATION: After provision of the relaxation of Age in Col. No. 3 of table above; the age shall not exceed the maximum age prescribed for the post for the candidates at Sl. No. 3 & 4. The selection of the candidate will be done on the basis of marks of the online or OMR based (objective type) examination and interview put together.